Transparency and light are key ingredients in this multistory welcoming experience. Regional materials and organic forms invite users to the heart of the Cali-Baja innovation experience. Perez-Vargas is a California-based architect. He was born and raised, however, in Guadalajara and feels that Yumana is, in its way, guiding him home again. As a young boy, he loved to draw, and as luck would have it, his family lived across the street from one of Mexico’s best-known architects, Ignacio Diaz Morales (1905–1992). Though essentially retired at the time, Morales put a young Perez-Vargas to work on some restoration projects and introduced him to Luis Barragán (1902–1988), another Tapatío—Guadalajara native—and master of Mexican architecture. Barragán was a winner of the Pritzker Architecture Prize. “There was so much opportunity,” he says. 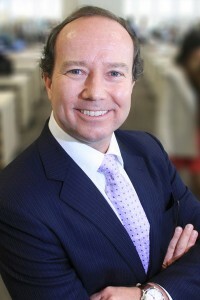 “KMD was expanding internationally, so I got to work on projects all over the world.” In 2012, the firm was going through a changing of the guard, and Perez-Vargas, who was head of the international division and chairman of the board, thought the timing was right to take a new approach and branch out on his own. This vision led to his founding of GDS-Land, a real estate development company. “For projects under the GDS-Land banner, we coordinate the efforts and interests of landowners, developers, designers, investors, and the larger community,” Perez-Vargas says. “After so many years in this business, I have a pretty deep network and know how to select the right type of partners for different projects.” This is exactly what he is doing for the aforementioned Yumana project. Perez-Vargas says Yumana’s Cali-Baja site is “the ideal location for a major mixed-use project.” Tijuana is growing by approximately 80,000 new residents every year and is projected to become Mexico’s second-largest city by 2030, according to the National Population Council. The second anchor tenant is the CRIT hospital (Centro de Rehabilitación Infantil Teletón), part of a network of rehabilitation and medical centers that care for children with physical disabilities and cancer. An annual telethon, established in 1996, raises funds for the construction of new facilities throughout the country. The consortium of landowners and investors behind the Yumana project provided CRIT with seven acres for building. Next up is Yumana’s tech center, followed by retail and residential elements. “We’re in conversation with three global technology companies,” Perez-Vargas says. “This will be a major component of the project, with a total of eight buildings, similar to a campus you would see in Silicon Valley.” Construction is expected to start in the fall of 2016. In fact, Tijuana is becoming a high-tech force of its own. According to the Tijuana Economic Development Corporation, there were 32,000 workers employed by medical device manufacturers in Tijuana in 2013, surpassing all other North American cities. These manufacturers in Tijuana comprise what is increasingly being called the “medical device cluster of the Californias” or the “Tijuana-San Diego bio border.” Another 43,000 people work for electronics manufacturers in the area. “Costs are lower than in the United States, and Mexico offers strong intellectual property right protections via NAFTA, TRIPS, and other free trade agreements,” Perez-Vargas says. The region also offers a growing pool of employable talent. In addition to some well-known universities just over the border in southern California, there are several highly ranked colleges in the Tijuana metropolitan area, including la Universidad Autonoma de Baja California and el Instituto Tecnológico de Tijuana. The latter specializes in engineering, science, and technology. According to UNESCO, Mexico had 580,000 students enrolled in engineering programs in 2011, more than Brazil or Germany, translating into almost 4.9 engineering students per 1,000 people in Mexico, compared to 3.6 in the United States. Though some companies choose the maquiladora route and locate only manufacturing operations in Mexico, an increasing number of companies are starting to locate design and engineering crews there, too. For instance, Ford Motor Company’s Mexico unit tripled its local engineering staff to nearly 1,000 between 2010 and 2013, and filed for forty US patents during those three years. The name Yumana honors one of Mexico’s native tribes. The Yumana occupied lands in the northern end of the Baja peninsula, from the Pacific coast to the Colorado River delta, encompassing today’s Tijuana region. Cali-Baja encompasses the entire California and Baja, Mexico, border region—including San Diego County, Imperial County, and Mexico’s Baja California. The English translations of the two colleges in Tijuana are the Autonomous University of Baja California and the Tijuana Institute of Technology. The English translation of CRIT is the Children’s Rehabilitation Center Telethon. A maquiladora is a Mexican manufacturing operation, in which factories import key materials and equipment on a tax-free basis to assemble, process, and manufacture in Mexico and then export the product, usually back to the raw material’s country of origin.